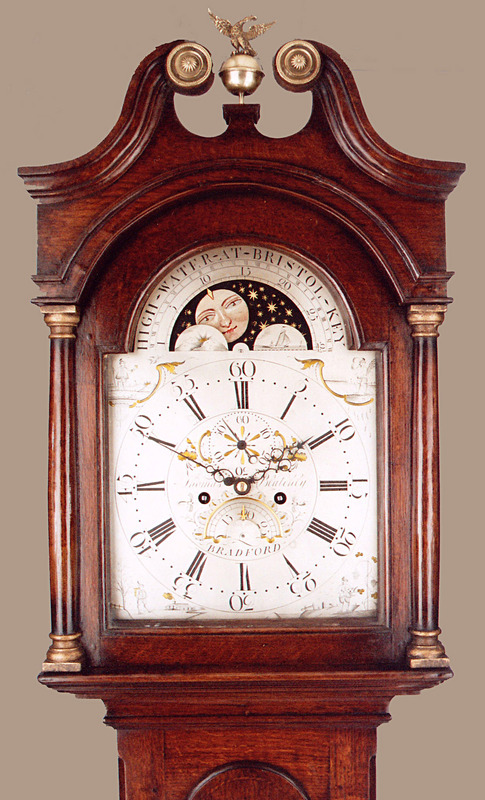 Thomas Blatchly of Bradford Longcase Oak Circa 1785 - Height 92in. This Longcase Oak Archive's Maker - Thomas Blatchly of Bradford (Bradford on Avon). Recorded apprenticed to Thomas Bullock, Lyncombe, Somerset 18 June 1765 for 7 years, ?15 premium. The Salisbury Journal reports that in 1778 his shop in Bradford was broken into and a watch stolen. Beautifully proportioned late 18C long door quarter sawn stellar inlaid oak case with swan neck pediment. 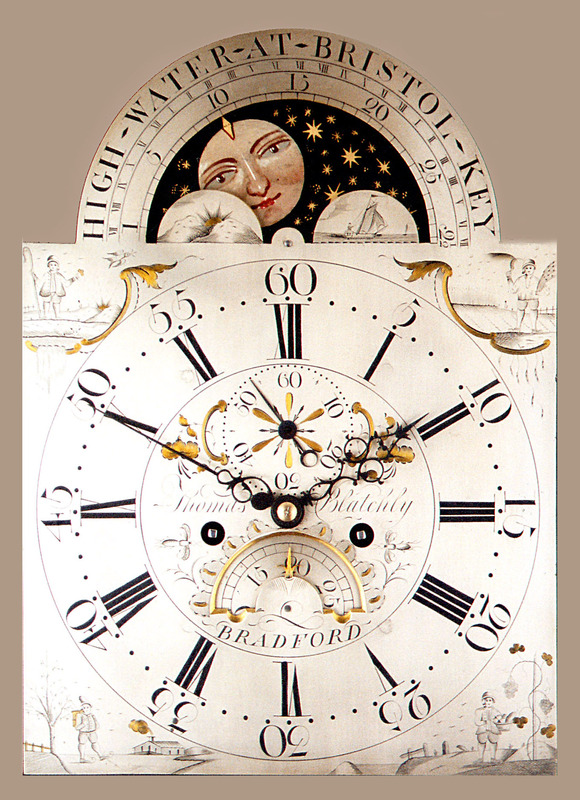 Exquisitely engraved and silvered 12" breakarch brass dial with moon phases and "High Water at Bristol Key". Engraving depicts the four seasons.Engraved seconds dial and date lunette. Good quality 4 pillar with hourly (rack) striking and moonphases. Thomas Blatchly of Bradford (Bradford on Avon). Recorded apprenticed to Thomas Bullock, Lyncombe, Somerset 18 June 1765 for 7 years, ?15 premium. The Salisbury Journal reports that in 1778 his shop in Bradford was broken into and a watch stolen. 92" ( 234 cms. )or 90.25" (229 cms. ).